From the tips of her magenta slippers to the top of her colorful hair, this 3-dimensional CHARM IT! 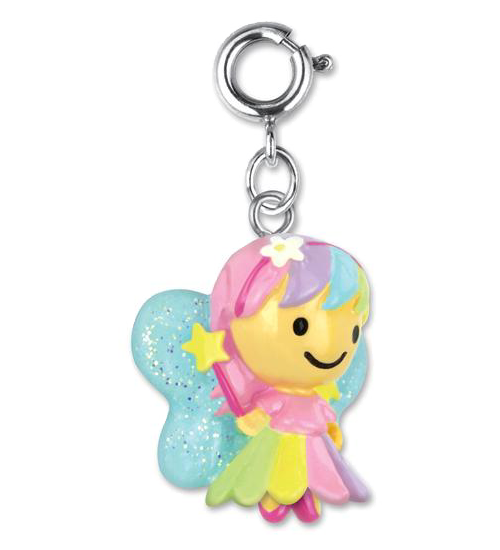 Rainbow Fairy charm is bursting with fanciful fun. With glitter (or is it fairy dust?) 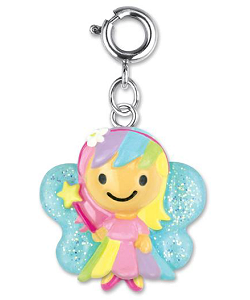 adorning her blue wings and a petal skirt in a rainbow of colors, this sweet rainbow fairy charm is ready, with her star-topped wand and a huge smile, to spread magical goodness wherever she goes. With a simple snap of a clasp, girls can add a splash of whimsical personality to their charm bracelets with this CHARM IT! Rainbow Fairy charm. Every little fairy should have a magic wand, especially one that shimmers and glimmers with glitter and bling. Your CHARM IT! girl will love showing her pretty princess spirit with this fun Tiara charm. Girls will fall in love with this charming CHARM IT! rainbow heart link charm bracelet. This adorable Mermaid charm is all smiles in her long pink hair, magenta top, and glittery green tail.